Kevin Siembieda wears many hats. 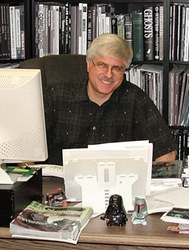 In addition to being the founder, owner, president and publisher of Palladium Books, he is Palladium's chief game designer, lead writer, art director, creative mentor and visionary. Of course, all these hats were born of necessity. You see, Kevin and Palladium's humble beginnings didn't allow him to hire people to do those jobs until years later. He had to do it all himself. He says this was a good thing, because it taught him every aspect of the business and gave him a deep understanding for each job, and respect for the people who have to do them. According to Kevin, he has always been driven by an overactive imagination and a need to create worlds and tell stories. Storytelling and publishing are in his blood. He also delights in giving talented young artists and writers a forum to hone their abilities and the chance to be published. For years, Palladium Books has been eager to give "fans" with a dream to write or illustrate a shot at doing just that. Many of the writers and artists for Palladium got their start or early break at Palladium. In fact, one of the main reasons for the creation of The Rifter® sourcebook series was to provide an opportunity for fan writers and artists to submit their work for our consideration to publish. The best of such submissions make their way into the pages of The Rifter®.